While browsing Settings with the 6 Plus in a portrait (or vertical orientation) menu selection moves as one would expect. . In the midst of browsing Settings in portrait orientation, turning the phone from portrait into landscape (or horizontal orientation) appears to generate some aberrant behavior. The menu system does not appear to work as one might expect. It would also appear on the 6 Plus that menu descriptions are somewhat obscured in some cases. Visually, it appears as though any MMD Composer Setting descriptor with more than 5-6 words does not render the complete description. A portion is cut-off. 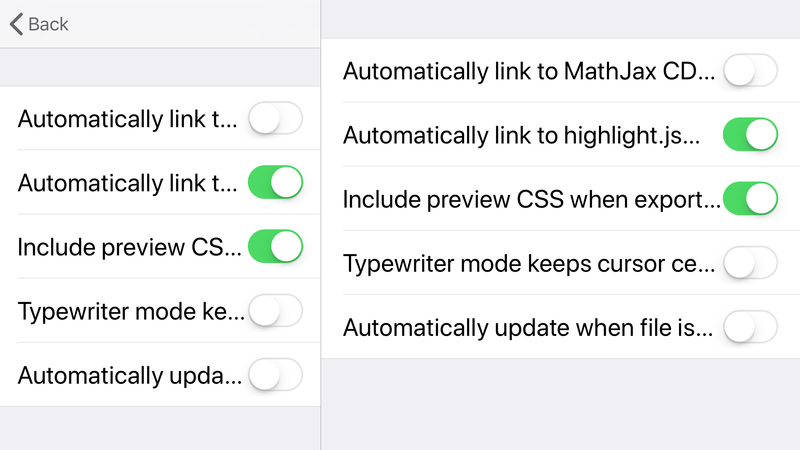 Text size in iOS Display & Brightness Settings is about halfway. No bold or zoom options enabled. Hmmm... I think the Plus sized phones seem to get confused as to whether to behave like an iPhone or an iPad. It looks like in portrait, iOS treats the device like an iPhone where the table is given the entire screen. When rotated to landscape, it decided to become an iPad and the table switches to the "master" spot in a typical "master-detail" view on an iPad. I'll have to dig into exactly what's going on and how to fix it. I would prefer that the table take the entire screen, just like it does on a regular iPhone. That gives you additional space to read what's going on. As my previous response indicated. I’ve attempted to look at other programs and their use case for a similar scenario. I appreciate that every developer is his or her own artist and I only supply these examples as observations regarding what I think are similar use-cases. That said. 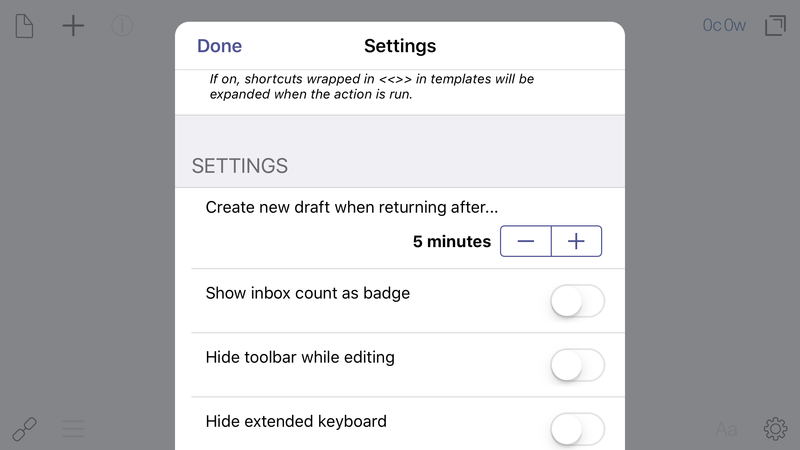 Drafts-4: When pressing settings in a vertical orientation - the settings display full-screen. Should the phone turn to a landscape orientation the settings menu becomes a centered, resized, floating window in the middle of the display. It does not take up the entire screen any longer and one can see parts of the main UI in the background. It almost appears as the transition occurs from the bottom of the screen and pops upward. But perhaps my eyes are misinterpreting the animation. Unfortunately, I am not versed in iOS window jargon. I think, based on looking at Drafts-4, Editorial and Ulysses, that Drafts-4 has the most elegant solution with regard to the screen transition(s). Ulysses seems somewhat jarring or confused with how to handle the screen transition. >There’s also one removal: rotation support on iPhone. (The iPad app still rotates.) iPhone rotation has always been disabled by default, and had been buried in Nitpicky Details for a long time, so very few people have ever used it. Meanwhile, it has become increasingly difficult to support and maintain, especially with the modern complexities of rotation and the dramatically increased workload of supporting the iPhone X in landscape. >iPhone rotation has simply proven far too costly to maintain for its extremely low usage, and it had to go to free up more of my time for more highly demanded features. I apologize to the few people who did use it, and I hope this isn’t too disruptive for you. Having trouble reading this? View this discussion online: iOS Beta Build 51 Settings 6 Plus. While I understand the goal of having the settings in a window in the middle, for iPhone Plus, this seems to be the worst option. I might look at doing it for iPad, but iPhone needs the landscape view to allow for longer preferences to be visible. I do understand Marco's thoughts about Overcast and forcing it to stay in portrait mode. For his app, it makes sense. For a text editor, it would have to be landscape if I picked one, in order to allow use of the preview. But I myself prefer to type in portrait (the keyboard seems to work better that way). So I think I'm forced to supporting both. Thanks for your comments on the other apps.